We have information you must know before you buy the MX-5 Miata. 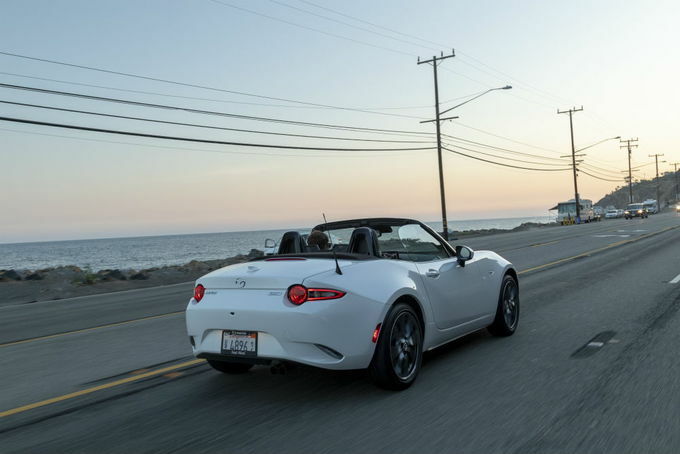 The 2019 Miata RF (hard top) and soft top continue flowing into dealers nationwide. The new model year brings a more powerful 2.0-liter engine with 181 horsepower, along with an updated exhaust system and automatic emergency braking. A brown soft top is now optional. As usual, the entry-level Sport is easiest to find. The Miata is one of the few cars widely available with a manual transmission. Factory offers on the RF and soft top are now the same. Current factory offers vary by region and will remain in effect until April 30, 2019. Examples shown here are for Los Angeles. Mazda usually adds holiday bonus cash in select areas for Memorial Day weekend. If you currently own or lease a Mazda, you can get a $750 loyalty bonus for staying with the brand. It's yours whether you purchase or lease. This is the only factory cash available on the 2019 Miata at the moment. It may be many months before we see a rebate that's available to all buyers. Mazda hasn't announced any lease offers yet on the 2019 Miata. For now, see your local dealer for a lease quote. Note that the Miata is seldom a good lease value, so purchasing will probably make more sense. 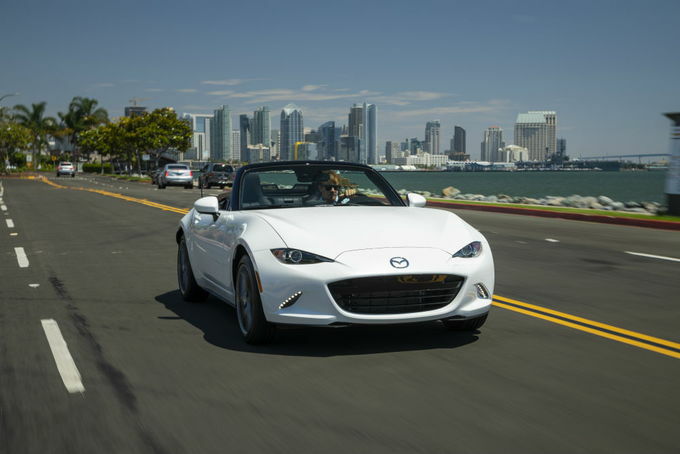 The best financing deal this month on the 2019 Miata is 1.9% for 72 months, a point lower than last month. You can combine it with the loyalty bonus if you qualify. If you were to distill driving pleasure down to a small package, you'd find the 2019 Mazda MX-5 Miata as the evaporated product ready for bottling. While it isn't packing the most horsepower in the segment, the Miata is incredibly nimble, capable of maintaining insane amounts of speed through the corners, and a joy to drive. These factors combine to make it quite possibly the best sports car you can buy with a price tag south of the Porsche Boxster. 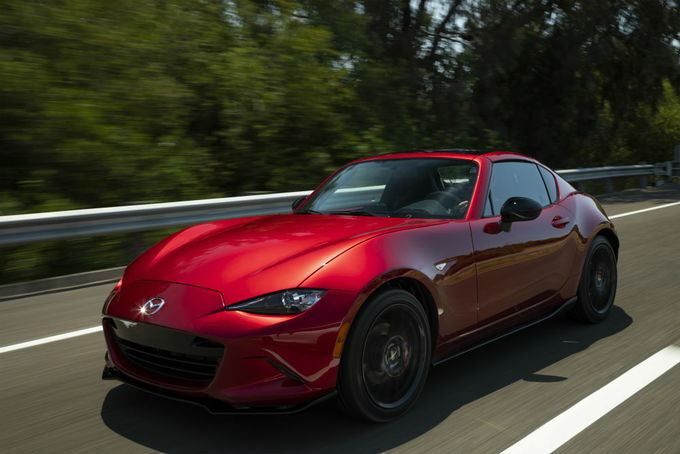 The 2019 Mazda Miata may look very similar, but there's a big difference over the last year: the engine's power has been increased from 155 horsepower to 181. While 26 hp may not seem like a lot, it makes a huge difference in a car that weighs less than 2,400 pounds. 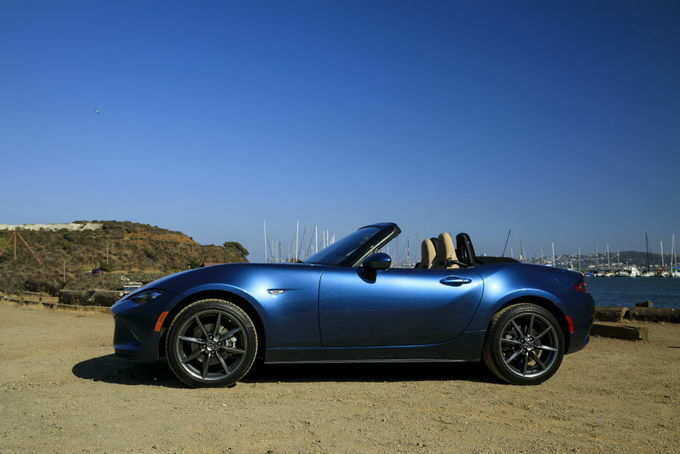 The Miata also offers more packages, options, and features over the previous model year. The Mazda Miata is powered by a naturally-aspirated 2.0-liter four-cylinder engine that puts out 181 hp and 151 pound-feet of torque. While this doesn't seem like a lot in a world where you can get a Toyota Camry with over 300 hp, it's perfect for the chassis. While you can get a Miata with a competent six-speed automatic transmission for an additional $1,350, the excellent six-speed manual is the transmission to get. Not only does it connect you to the driving experience better, manual models in some trims are also equipped with a Bilstein sport suspension, a limited-slip differential, and shock tower bracing for better handling. If you get the automatic, you get a softer and less fun Miata in all aspects. The Miata comes with one of two roof types: a classic soft top or the folding metal roof found in the Miata RF. 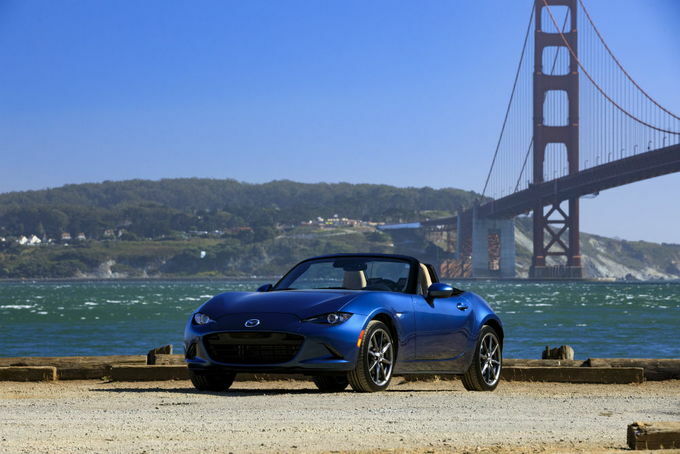 The soft top is available at all trim levels, but the RF can only be had with the Club and Grand Touring trim levels at a $2,755 premium over the soft top model. This price includes the addition of not only the roof, but also an additional multifunction display in the gauge cluster. While the Miata eschews many features found in similarly priced vehicles for the sake of driving pleasure, the most basic models still get keyless entry, LED headlights, a six-speaker stereo, and a leather-wrapped steering wheel, parking brake, and shift knob. Higher trims are offered with heated seats, leather upholstery, traffic sign recognition, and rain-sensing windshield wipers. At $26,625 (all prices include an $895 destination charge), the cheapest way to get into a new Miata is with the base Sport trim. For this price, you don't get much outside of the standard features previously listed. Black cloth seats are standard fare, but you get a choice of four paint colors to go with the contrasting black soft roof. It may not be much, but you don't really buy a Miata to be coddled in luxury; you buy it to drive it and the Sport works just fine for that purpose. The only option package available outside of dealer accessories is the $850 I-Activsense Sport Package, which offers a modest grouping of driver assistance features like low-speed automatic emergency braking, lane departure warning, blind-spot monitoring, and rear cross-traffic alert. There are also accessory packages that verge on the border of an option package like the $425 Interior Package that adds aluminum pedals, door sills, and an oil cap, the $350 Interior Lighting Kit for some interior lighting, and the $1,550 Appearance Package that adds some exterior styling upgrades like a spoiler, front air dam, and side-sill extensions. The Club trim starts at $30,485, and steps up the features a notch. 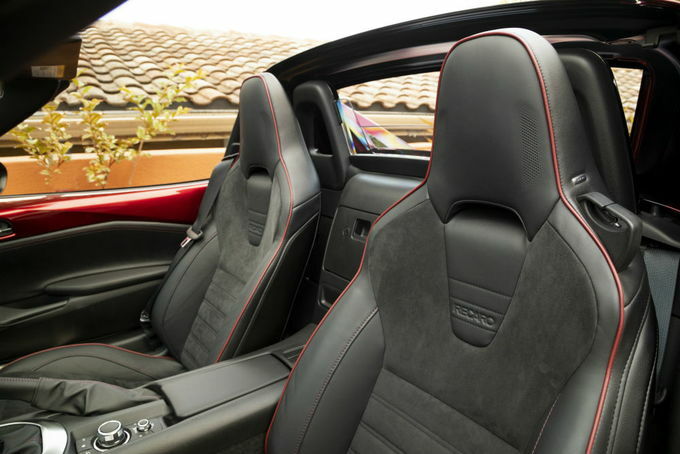 The Club receives some performance upgrades like the Bilstein sport suspension, limited-slip differential, and front shock tower bracing (on the manual models only), while also adding a nine-speaker Bose audio system with speakers in the headrests so you can hear music with the top down, heated seats, blind-spot monitoring, and rear cross-traffic alert. 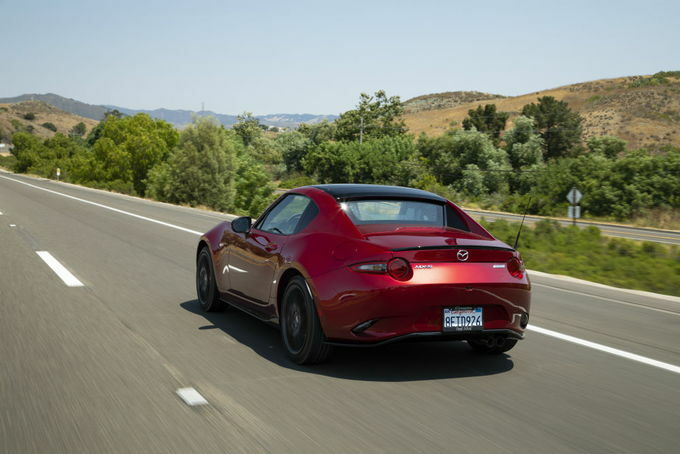 The Club is the lowest trim offered in the Miata RF configuration with the folding metal roof as previously mentioned, and is also available with quite a few more packages over the Sport model. The most extensive package is the $4,470 Brembo/BBS Recaro Package that replaces the standard cloth seats with leather and alcantara-trimmed Recaro sport seats, Brembo front brakes, BBS forged 17-inch wheels, and some aero upgrades. 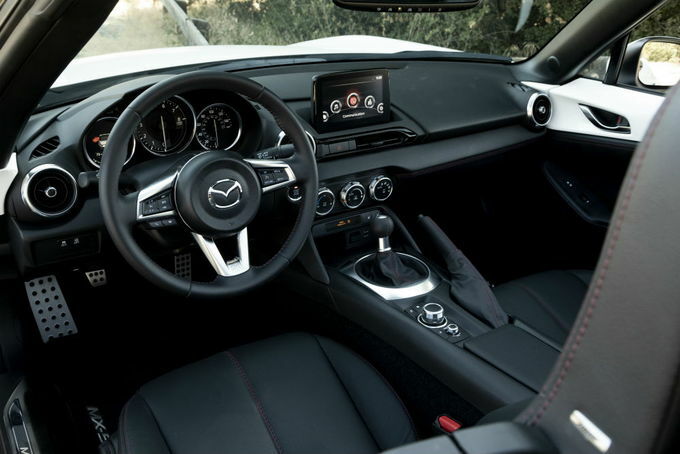 If you'd rather have just have leather seats instead of the tight Recaros, Mazda offers the Brembo/BBS Package for $3,770 that includes everything from the previous package but with black leather seats instead. The I-Activesense Club Package is cheaper than its equivalent in the Sport package at $450, but it only adds automatic emergency braking and lane departure warning as the other two features come standard. Color selection is also increased slightly with the addition of a metallic gray exterior paint for an extra $300. 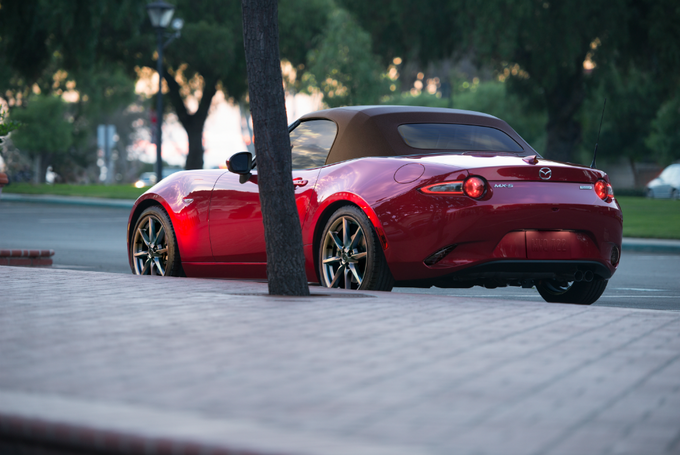 The highest trim level for the Miata is the $31,675 Grand Touring, which flirts with the idea of being a luxury car. The Grand Touring gets niceties like adaptive headlights with an automatic on/off feature, rain-sensing wipers, automatic climate control, an auto-dimming rearview mirror and side mirrors, leather-trimmed seats, and navigation, while all driver assistance features like lane departure warning, low-speed automatic emergency braking, and traffic sign recognition are standard features. Also of note, the Grand Touring is offered in a metallic blue, offering a bit more color variety to the palette of white, black, grey, and red that other trims offer. Interestingly, the Grand Touring Package doesn't come standard with the performance upgrades of the Club trim like the Bilstein suspension, limited-slip differential, and shock tower bracing. Mazda sees the Club as the trim more focused toward performance while the Grand Touring is more oriented for overall driver enjoyment, and is therefore a bit softer. To this end, the Grand Touring doesn't get the option of either of the Brembo/BBS packages, but it's offered with the $550 GT-S Package that adds the suspension, differential, and bracing from the Club model to the Grand Touring. If you're buying a 2019 Mazda MX-5 Miata, get one with a manual transmission. If you don't know how to drive a manual but still want a Miata, find a friend who'll teach you the basics, then buy the manual Miata and hone your skills on it. The manual transmission is a cornerstone of the overall Miata experience, creating one more point of connection between the driver and the machine. More power. 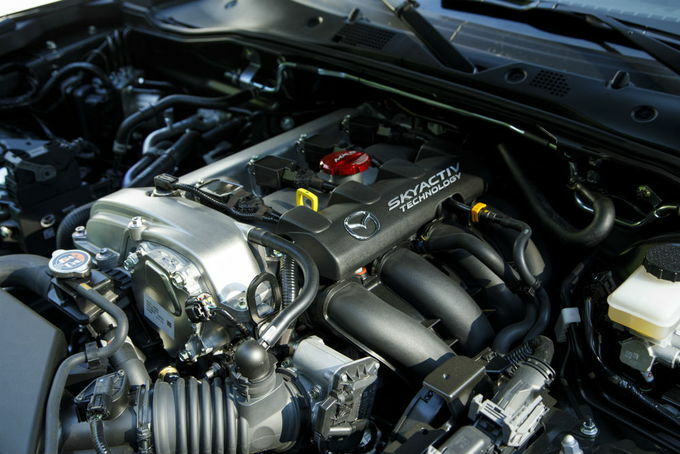 Although displacement remains the same for the 2019 Mazda MX-5 Miata, the automaker has done some serious tweaking of the 2.0-liter Skyactiv-G engine's vitals (pistons, connecting rods, crankshaft, flywheel, exhaust manifold), and upped injector pressure for more power, and swapped in a new muffler. The engine happily revs to 7,500 (up from 6,800), while horsepower stands at 181 (up from 155). The result is an upping of the already high engagement factor between driver and machine with higher revs, greater speed, and a more robust sound. Ride and handling. The Miata is the perfect small sports car. Handling is sharp, and throttle response is immediate. Feedback through the steering wheel (which now tilts and telescopes) and brake pedal is spectacular, and the slick six-speed manual transmission and firm-but-not-stiff clutch (our choice) make the MX-5 drivable in stop-and-go traffic, while back roads corners are carved with the precision of a surgeon. You can firm up the double wishbone front and multilink rear suspension by choosing a manually-equipped Club or Grand Touring model – the latter equipped with the optional GT-S package. But consider both with caution, unless track days are the highlight of your calendar. Good fuel economy. Despite the increase in power, fuel economy remains the same as last year. Manually-equipped models score an EPA-estimated 26 miles per gallon in the city, 34 mpg on the highway, and 29 combined for either the convertible or RF hardtop. Drop in the slightly-less-entertaining automatic, and those figures rise slightly to 26/35/30 mpg (city/highway/combined). For comparison, the Toyota 86 and Subaru BRZ are rated at 24 mpg combined with manual transmissions and 27 combined with automatics. Lovely to look at. Perfectly proportioned from its beginnings with a long hood and short trunk, the newest generation, unveiled three years ago, adds a number of expressive touches with sharper creases, slim, rakish headlights, bulging fenders, and a flat trunk that accentuates the concave upper rear fascia. Likewise, the cozy interior is restrained without looking spartan. The shifter falls easily to hand, the pedals are perfectly placed for heel-and-toe shifting, while the highly-sculpted body-colored door sills bring some of the outside inside. At the same time, the touchscreen looks out of place, the infotainment software is kludgy, the cup holders are hilariously out of reach, the 12-volt outlet is located in the passenger's footwell, while the infotainment controller is placed directly under the driver's forearm – more than once we unintentionally changed radio stations and the audio source. Final thoughts. A modern interpretation of the classic British roadster, the fun and affordable 2019 Mazda MX-5 Miata is the perfect second vehicle, even in winter (a fact we can attest to, provided you install a good set of winter tires). But aside from the obvious size and practicality constraints, the awkward placement of the infotainment controls and the oddly-placed cupholders detract from what is otherwise a spectacular driving experience. Looking at the short list of competitors, the Toyota 86/Subaru BRZ have more horsepower, more interior room and, with the rear seat folded, more cargo space. The Nissan 370Z Roadster brings 332 horsepower to the table, while the Mini Cooper Convertible (the Roadster is no longer produced) offers better fuel economy. We have partnered with trusted dealers in your area to give you a great price on the new Mazda MX-5 Miata.